Sprite objects consist of images and animations and are very popular in games: Sprites can display a large variety of game components such as characters, platforms and user interface elements..
Each animation can represent for example a state of the object (running, walking, exploding…). An animation is itself composed of directions, corresponding to the angle of the object (looking left, right, etc…). Animations are displayed in the Animations panel, on the left by default. To add a new animation, just click on the first button of the toolbar. 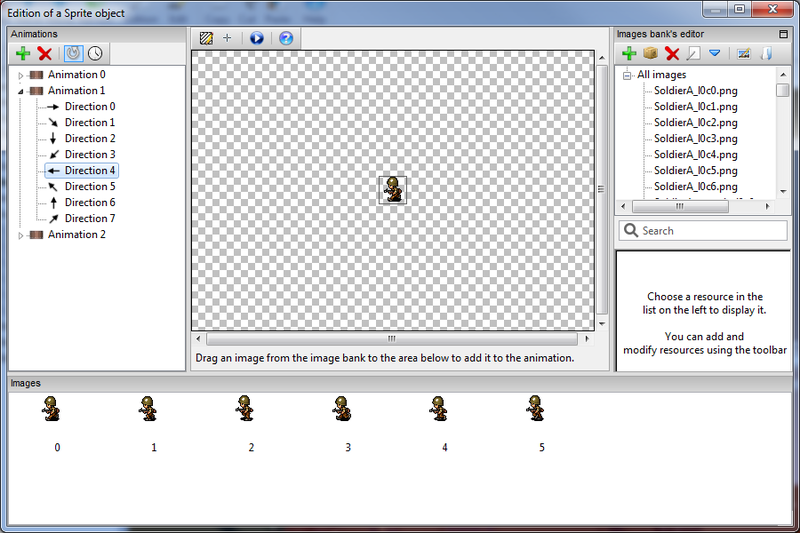 You can also make a right click on an already existing animation and choose “Add an animation”. 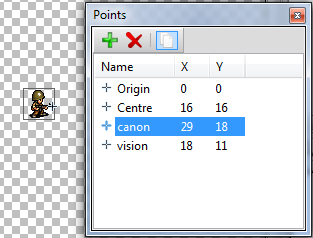 To edit a specific animation, just select it, and its images will be displayed in the Images panel. Select an point in the list to display it on the image. You can then click on the image to move the point. You can add a new rectangle by clicking on the first button of the toolbar. Masks are displayed on the image, and they can be moved by dragging them. You can also make a double click on a mask in the list to enter its coordinates.